Everything in the wild was a little late this year – until the warm weather in April! I hope we don’t get late frosts. One of my neighbours reminded me that some of the best native daffodils round here are in Pinfields Wood on the lower slope of the Lickeys. They were lovely in The Meadows as well this year, still going in April. I saw my first bluebell in flower in early April, so they’re catching up! Peck Wood is expected to be open for bluebells on weekdays from April 27 to May 6, so take the once-a-year chance and go! May is traditionally the month when spring gives way to summer. At one time May Day was a major celebration, and the tradition persists in a scattered way all over Europe. It is the Celtic festival of Beltane, falling halfway between the spring equinox and the summer solstice – hence the turning point between spring and summer. It was later taken up as a labour day, celebrating the work of common people, perhaps chosen because it was so ingrained in ordinary people’s lives as a time to unite and celebrate. It wasn’t long ago that it became a bank holiday in England, though not of course on May Day itself when the more political celebrations were held. Some of the images in the procession and dance show that it used to be a fertility ritual, like most spring celebrations. The celebrations are still pretty rumbustious! The songs emphasise togetherness and the banishing of winter. The other bank holiday at the end of the month used to be the Whitsun weekend, rather earlier and variable because it is linked to the date of Easter. It used to be a celebration day, with people wearing new clothes (as at Easter) and country processions and dances. White clothes were worn and blossom brought in to decorate – usually may blossom again. More recently, red is often worn, as a sign of the fire of the Holy Spirit. The hawthorn, sometimes called whitethorn, was a powerful tree for protection. It was planted near houses and at important spots to ward off witchcraft. It was the tree of the pagan earth-goddess, representing birth, fertility and death. It has a very human smell, which some people find overpowering. Because of its powerful pagan and magical associations, in more recent times it was banned from churches or even from houses. The exception to this was in predominantly Roman Catholic areas, where hawthorn became associated with the Virgin Mary, who often took over Celtic goddess symbols (as in Candlemas). All the more reason for it to be banned from Church of England churches! It’s a pleasure to have some good tree news this month – and including hawthorn! I have watched my neighbouring farmer plant a completely new hedge to replace a fence between two fields. A lot of it is hawthorn, but with other native species too. At the same time, he has been properly laying some other predominantly hawthorn hedges which he planted about 17 years ago. Laying hedges helps them grow thicker and makes them possible to maintain without cutting them to the extent that they don’t flower any more. So, as well as keeping all his longhorn cattle (including lots of new calves) and sheep in place, the hedges provide nectar for insects and berries for birds. He has also dug two new ponds and is reviving another old one. Ponds help slow the flow of water, reducing the risk of flooding and preventing run-off of unwanted things like manure into water-courses. They will of course also be wildlife habitats, for newts, frogs and water birds. 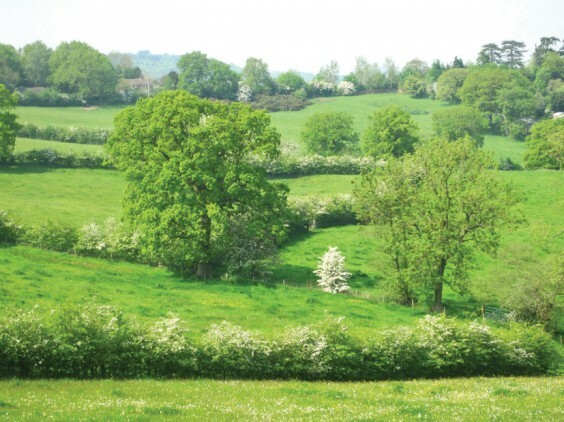 The hedges and ponds are all part of farming under the Countryside Stewardship scheme. This is currently being changed and I went to a meeting locally to find out about this, and about work being done to improve the River Arrow and other watercourses. Our river has poor water quality, and quite a lot of this is due to farming practices which allow phosphates to be washed into the streams. There’s a lot farmers and other landowners can do to lessen this. The Worcestershire Wildlife Trust has been doing a major project on improving the Bow Brook (a feeder of the Arrow on the other side of Redditch) and are hoping to start one on the Arrow near Redditch. It’s good to see that some farmers and landowners round here are taking their responsibilities to the environment seriously, although some still contribute to the lack of biodiversity in our waters. One or two people have asked me about the trees planted for Network Rail near Alvechurch station. I think they expected a full-grown hedge, but of course it’s only small and will take ten years to look like a hedge. If you look at Mick’s Wood, between Hopwood, Alvechurch and the canal, you can see what something planted seven years ago looks like, and Withybed Wood is a proper wood after just over twenty years of growth. Patience is needed. One of the problems with funding for Stewardship is that it is competitive, and therefore not guaranteed to continue. Land management needs a very long-term view and a consistent approach. Talking of hedges and boundaries, another May festival in the old church calendar is Rogation-tide. This year it is on May 10. At one time, people walked the boundaries of their parish, often calling at key markers like oak trees (the gospel oaks and calling oaks) while they blessed the crops for the next harvest. This is still carried out in the parishes round here, though not every year. With the bluebells in the woods and hedges, you should see some of the other lovely flowers of this season – yellow archangel, wood sorrel and wood anemone, and the common but beautiful red campion and white stitchwort. There is also wild garlic, which always grows in a different bit of the wood from bluebells. Among the taller trees, the gorgeous blowsy horse chestnut echoes the green-and-white of the may. By the water you may see marsh-marigolds (kingcups) which were one of the favourite flowers for May Day garlands. May is also the month for the start of flowers in our meadows and pastures. In Eades Meadow, the earlier dandelions will be replaced by cowslips and green-winged orchids, as well as bugle and bluebells, and lots more. Later in the month these will be followed by common spotted orchids and fragrant orchids, along with ragged robin and moon daisies. When the sun shines, you will see the butterflies out gathering nectar. Most of these flowers can be found more locally, though not in such abundance. I have hopes that the station platform bank in Alvechurch will get its moon daisies back this year, and there are others along the canal and roads, and on the Hopwood motorway roundabout until they remember to mow them down! The flowers at the station are slowly appearing, with lots of coltsfoot, speedwell, red dead nettle and wild strawberries coming now. Ragged robin grows in a wet field between Withybed and Foxhill. There used to be some by the new fishing lakes at Bittell but I suspect it has gone, and there is some more near the allotments in Alvechurch. It’s related to red campion, but quite a rare plant now, needing wet meadows which are not “improved”. There are a few orchids about near here, at the mercy of mowers, so I will be having a good look to see if any come up this year. As the trees get their leaves, less light comes to the ground, and woodland will lose most of its flowers after the bluebells go. It’s the time for flowers out in the open, so head for the fields as the month goes on! May blossom will start the month, and by the end we will be golden with buttercups. Head for the Meadows in Alvechurch on May 3 for the Picnic in the Park, and to the canal on May 15–17 (which includes a wildlife walk on the Sunday morning). Here is one of the poems I wrote for the 200th anniversary of the canal. The Withybed poets will be reading some of these at the canal festival. And here is the landscape I know. Made this, changing fields, changing lives. Sheltering dog’s mercury and yellow archangel. That was a field hedge, and before it a wood. On the far side, look. There are the alders. A new hedge, a new line of life. For my next sloe gin, scenting the dark thorn. Whitening the world and making it whole. Nest in their leaves and call out the seasons. Its still waters carrying the flow of life.